Slick hardback drum shades in black. Add sophistication to any decor with these shades, adding them to your table lamps or floor lamps. 13" across the top x 14" across the bottom x 10 1/4" on the slant x 10" high. Set of two unlined hardback drum shades from the Brentwood collection. Black 100-percent polyester material. Hardback white poly styrene inner liner. 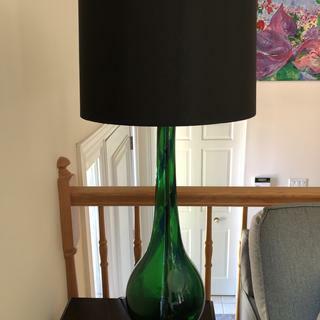 Right size for my lamp based and couldn't find black shades anywhere locally. I purchased lamps made out of a silver material with white shades and I think it would look better with black. I have 2 lamps with black & white french country design on them. I wanted black shades. These were the best I could find for the price. I actually wanted black square shades, but have looked everywhere and couldn't afford the price. The shades look elegant in my family room. Do you have this lamp or can I have these with a brass spider? Thanks! BEST ANSWER: I do apologize, these shades do not have a brass spider option. what colour is the inside of the shade? BEST ANSWER: Hi - the inside of the shade is unlined, so you see the white shade backing. There is an alternate photo view that shows the inside if you would like to see. I need only one shade! Can I buy one instead of two? Great quality shades for reasonable price. Perfect fit for my retro lamps! Perfect fit for my retro lamps! The shades are just what we wanted. I would have given them a five, but the finish of the fabric on the inside of the shade was a little rough. They come with all the hardware you will need for the spider fitting, finials and all. Light shines through the shade and shows off the weave of the fabric. Very nice. A gold braid made of rayon is hand-applied to trim the basic white linen of this chic lamp shade. With the look of twisted branches and exceptional texturethis set of 4 Organic Nest giclee print lamp shades feature clip-on style fittings finished in polished brass.